From the back cover: "How do you make God laugh? Tell Him you've got a plan. That's what Sister Mary Helen reminds herself when she sets out to start a new life - as a volunteer in a women's homeless shelter. A savvy septuagenarian with an adventurous streak, Mary Helen is no stranger to the shady side of San Francisco's hilly streets. 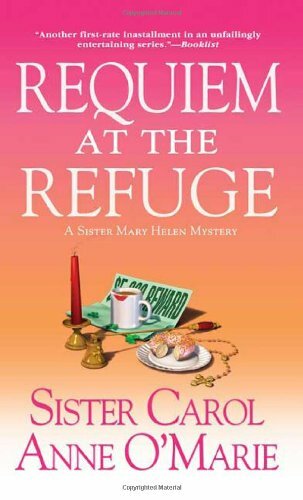 So when a young resident at the Refuge shelter is found dead, Mary Helen makes it her business to solve the murder. Soon this lady of the Order gets herself into a holy mess involving corrupt local politicians, a prostitution ring, and a tangled web of private eyes, police officers, and the "refugees" themselves. Mary Helen calls upon her beloved sisters at St. Francis College for salvation, but it's going to take a lot of prayers to protect Mary Helen from the dangerous characters - and shocking confessions - that come in her wake..."
I enjoyed this one and will look for more in this series. Gave this to someone known to me in a restaurant. Enjoy! Book was returned to me. Sent to sfrenchie, the Mystery/Crime/Thriller and Tea sweepsstake winner. I know I am late in sending my gifts, but I hope you enjoy them all the same. Arrived today, as part of the Crime and Tea Sweepstake. Thank you very much, I am looking forward to reading this and the other book in teh series that you sent with it. I will write another entry when I have read it and it is ready for release.